One of the great puzzles of the General Theory is Keynes’s rejection of the Fisher Effect on pp. 141-42. What is even more difficult to understand than Keynes’s criticism of the Fisher Effect, which I hope to parse in a future post, is that in his Tract on Monetary Reform Keynes had himself reproduced the Fisher Effect, though without crediting the idea to Fisher. Interestingly enough, when he turned against the Fisher Effect in the General Theory, dismissing it almost contemptuously, he explicitly attributed the idea to Fisher. But here are a couple of quotations from the Tract in which Keynes exactly follows the Fisherian analysis. There are probably other places in which he does so as well, but these two examples seemed the most explicit. Keynes actually cites Fisher several times in the Tract, but those citations are to Fisher’s purely monetary work, in particular The Purchasing Power of Money (1911) which Keynes had reviewed in the Economic Journal. Of course, the distinction between the real and money rates of interest that Fisher made famous was not discovered by Fisher. Marshall had mentioned it and the idea was discussed at length by Henry Thornton, and possibly by other classical economists as well, so Keynes was not necessarily committing a scholarly offense by not mentioning Fisher. Nevertheless, it was Fisher who derived the relationship as a formal theorem, and the idea was already widely associated with him. And, of course, when Keynes criticized the idea, he explicitly attributed the idea to Fisher. Economists draw an instructive distinction between what are termed the “money” rate of interest and the “real” rate of interest. If a sum of money worth 100 in terms of commodities at the time when the loan is made is lent for a year at 5 per cent interest, and is worth only 90 in terms of commodities at the end of the year, the lender receives back, including interest, what is worth only 94.5. This is expressed by saying that while the money rate of interest was 5 per cent, the real rate of interest had actually been negative and equal to minus 5.5 per cent. . . .
Like Fisher, Keynes, allowed for the possibility that inflation will not be fully anticipated so that the rise in the nominal rate will not fully compensate for the effect of inflation, suggesting that it is generally unlikely that inflation will be fully anticipated so that, in practice, inflation tends to reduce the real rate of interest. So Keynes seems fully on board with Fisher in the Tract. Then there is Keynes’s celebrated theorem of covered interest arbitrage, perhaps his most important and enduring contribution to economics before writing the General Theory. He demonstrates the theorem in chapter 3 of the Tract. If dollars one month forward are quoted cheaper than spot dollars to a London buyer in terms of sterling, this indicates a preference by the market, on balance, in favour of holding funds in New York during the month in question rather than in London – a preference the degree of which is measured by the discount on forward dollars. For if spot dollars are worth $4.40 to the pound and dollars one month forward $4.405 to the pound, then the owner of $4.40 can, by selling the dollars spot and buying them back one month forward, find himself at the end of the month with $4.405, merely by being during the month the owner of £1 in London instead of $4.40 in New York. That he should require and can obtain half a cent, which, earned in one month, is equal to about 1.5 per cent per annum, to induce him to do the transaction, shows, and is, under conditions of competition, a measure of, the market’s preference for holding funds during the month in question in New York rather than in London. . . . The difference between the spot and forward rates is, therefore, precisely and exactly the measure of the preference of the money and exchange market for holding funds in one international centre rather than in another, the exchange risk apart, that is to say under conditions in which the exchange risk is covered. What is it that determines these preferences? Compare Keynes’s discussion in the Tract to Fisher’s discussion in Appreciation and Interest, written over a quarter of a century before the Tract. For D dollars borrowed D + Di or D(1 + i) dollars are due in one yr.
and our problem is to find the relation between i and j, which will make the D(1 + i) dollars equal the B(1 + j) bushels. At first, D dollars equals B bushels. So, it’s clear that Keynes’s theorem of covered interest arbitrage in the Tract is a straightforward application of Fisher’s analysis in Appreciation and Interest. Now it is quite possible that Keynes was unaware of Fisher’s analysis in Appreciation and Interest, though it was reproduced in Fisher’s better known 1907 classic The Rate of Interest, so that Keynes’s covered-interest-arbitrage theorem may have been subjectively original, even though it had been anticipated in its essentials a quarter of a century earlier by Fisher. Nevertheless, Keynes’s failure to acknowledge, when he criticized the Fisher effect in the General Theory, how profoundly indebted he had been, in his own celebrated work on the foreign-exchange markets, to the Fisherian analysis was a serious lapse in scholarship, if not in scholarly ethics. 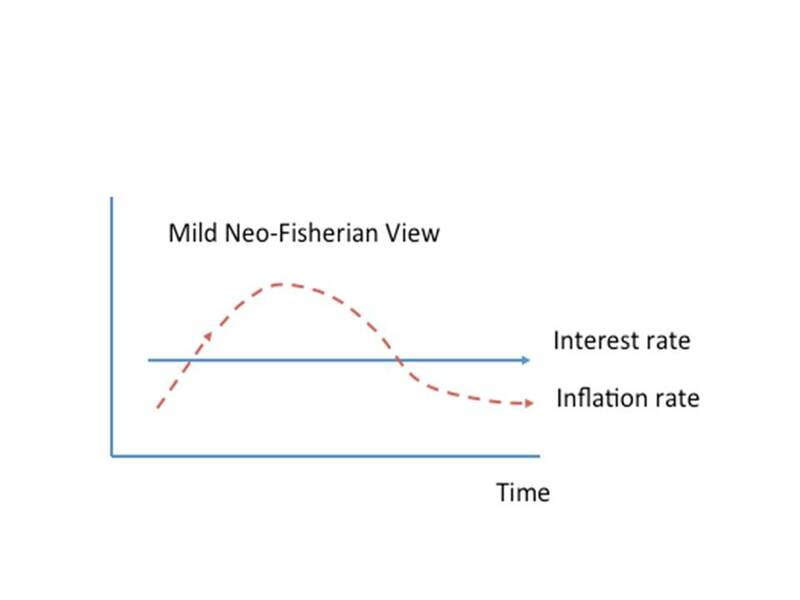 In a recent post, John Cochrane, responding to an earlier post by Nick Rowe about Neo-Fisherism, has tried to explain why raising interest rates could plausibly cause inflation to rise and reducing interest rates could plausibly cause inflation to fall, even though almost everyone, including central bankers, seems to think that when central banks raise interest rates, inflation falls, and when they reduce interest rates, inflation goes up. 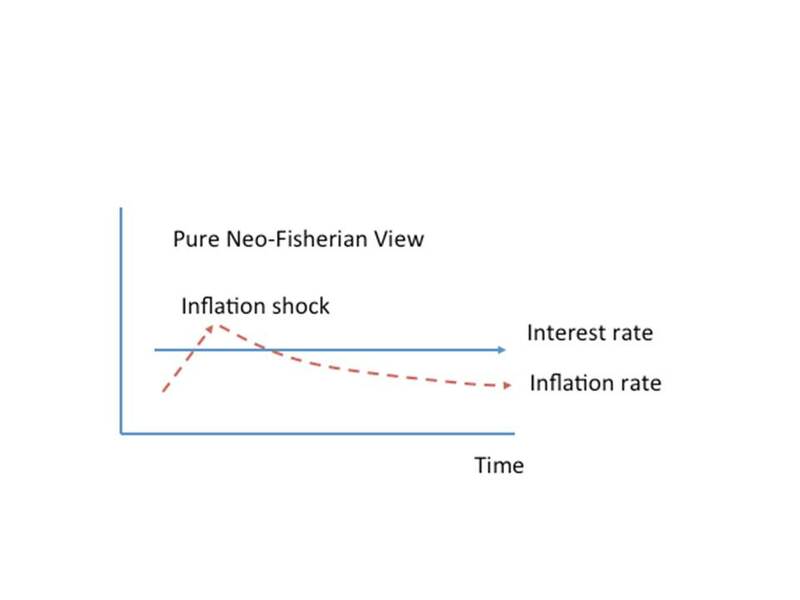 In his explanation, Cochrane concedes that there is an immediate short-term tendency for increased interest rates to reduce inflation and for reduced interest rates to raise inflation, but he also argues that these effects (liquidity effects in Keynesian terminology) are transitory and would be dominated by the Fisher effects if the central bank committed itself to a permanent change in its interest-rate target. Of course, the proviso that the central bank commit itself to a permanent interest-rate peg is a pretty important qualification to the Neo-Fisherian position, because few central banks have ever committed themselves to a permanent interest-rate peg, the most famous attempt (by the Fed after World War II) to peg an interest rate having led to accelerating inflation during the Korean War, thereby forcing the peg to be abandoned, in apparent contradiction of the Neo-Fisherian view. We can put the issue more generally as, if the central bank does nothing to interest rates, is the economy stable or unstable following a shock to inflation? For the next set of graphs, I imagine a shock to inflation, illustrated as the little upward sloping arrow on the left. Usually, the Fed responds by raising interest rates. What if it doesn’t? A pure neo-Fisherian view would say inflation will come back on its own. Again, we don’t have to be that pure. The milder view allows there may be some short run dynamics; the lower real rates might lead to some persistence in inflation. But even if the Fed does nothing, eventually real interest rates have to settle down to their “natural” level, and inflation will come back. Mabye not as fast as it would if the Fed had aggressively tamed it, but eventually. By contrast, the standard view says that inflation is unstable. If the Fed does not raise rates, inflation will eventually careen off following the shock. Now this really confuses me. What does a shock to inflation mean? From the context, Cochrane seems to be thinking that something happens to raise the rate of inflation in the short run, but the persistence of increased inflation somehow depends on an underlying assumption about whether the economy is stable or unstable. Cochrane doesn’t tell us what kind of shock to inflation he is talking about, and I can imagine only two possibilities, either a nominal shock or a real shock. Let’s say it’s a nominal shock. What kind of nominal shock might Cochrane have in mind? An increase in the money supply? Well, presumably an increase in the money supply would cause an increase in the price level, and a temporary increase in the rate of inflation, but if the increase in the money supply is a once-and-for-all increase, the system must revert, after a temporary increase, back to the old rate of inflation. Or maybe, Cochrane is thinking of a permanent increase in the rate of growth in the money supply. But in that case, why would the rate of inflation come back on its own as Cochrane suggests it would? Well, maybe it’s not the money supply but money demand that’s changing. But again, one would normally assume that an appropriate change in central-bank policy could cope with such a scenario and stabilize the rate of inflation. Alright, then, let’s say it’s a real shock. Suppose some real event happens that raises the rate of inflation. Well, like what? A supply shock? That raises the rate of inflation, but since when is the standard view that the appropriate response by the central bank to a negative supply shock is to raise the interest-rate target? Perhaps Cochrane is talking about a real shock that reduces the real rate of interest. Well, in that case, the rate of inflation would certainly rise if the central bank maintained its nominal-interest-rate target, but the increase in inflation would not be temporary unless the real shock was temporary. If the real shock is temporary, it is not clear why the standard view would recommend that the central bank raise its target rate of interest. So, I am sorry, but I am still confused. Now, the standard view that Cochrane is disputing is actually derived from Wicksell, and Wicksell’s cycle theory is in fact based on the assumption that the central bank keeps its target interest rate fixed while the natural rate fluctuates. (This, by the way, was also Hayek’s assumption in his first exposition of his theory in Monetary Theory and the Trade Cycle.) When the natural rate rises above the central bank’s target rate, a cumulative inflationary process starts, because borrowing from the banking system to finance investment is profitable as long as the expected return on investment exceeds the interest rate on loans charged by the banks. (This is where Hayek departed from Wicksell, focusing on Cantillon Effects instead of price-level effects.) Cochrane avoids that messy scenario, as far as I can tell, by assuming that the initial position is one in which the Fisher equation holds with the nominal rate equal to the real plus the expected rate of inflation and with expected inflation equal to actual inflation, and then positing an (as far as I can tell) unexplained inflation shock, with no change to the real rate (meaning, in Cochrane’s terminology, that the economy is stable). If the unexplained inflation shock goes away, the system must return to its initial equilibrium with expected inflation equal to actual inflation and the nominal rate equal to the real rate plus inflation. In contrast, the Wicksellian assumption is that the real rate fluctuates with the nominal rate and expected inflation unchanged. Unless the central bank raises the nominal rate, the difference between the profit rate anticipated by entrepreneurs and the rate at which they can borrow causes the rate of inflation to increase. So it does not seem to me that Cochrane has in any way reconciled the Neo-Fisherian view with the standard view (or at least the Wicksellian version of the standard view). PS I would just note that I have explained in my paper on Ricardo and Thornton why the Wicksellian analysis (anticipated almost a century before Wicksell by Henry Thornton) is defective (basically because he failed to take into account the law of reflux), but Cochrane, as far as I can tell, seems to be making a completely different point in his discussion. The week before last, Noah Smith wrote a post “The Neo-Fisherite Rebellion” discussing, rather sympathetically I thought, the contrarian school of monetary thought emerging from the Great American Heartland, according to which, notwithstanding everything monetary economists since Henry Thornton have taught, high interest rates are inflationary and low interest rates deflationary. 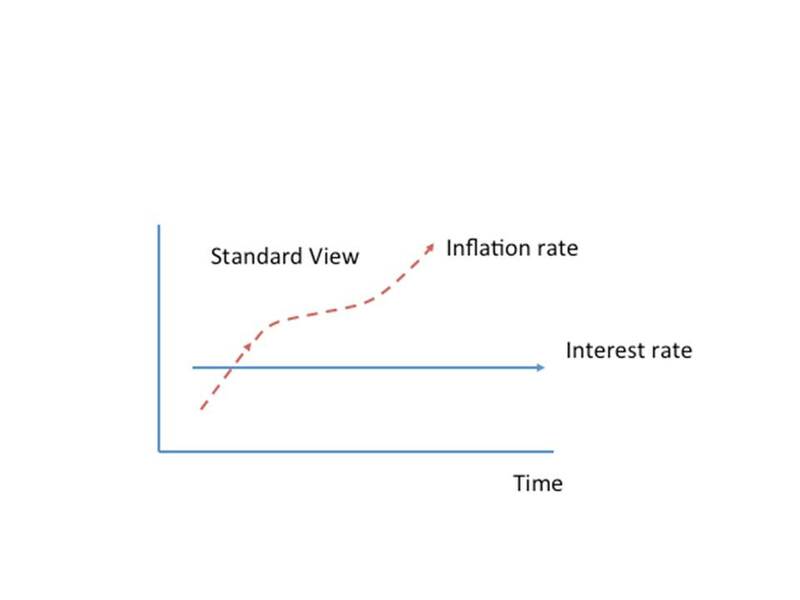 This view of the relationship between interest rates and inflation was advanced (but later retracted) by Narayana Kocherlakota, President of the Minneapolis Fed in a 2010 lecture, and was embraced and expounded with increased steadfastness by Stephen Williamson of Washington University in St. Louis and the St. Louis Fed in at least one working paper and in a series of posts over the past five or six months (e.g. here, here and here). And John Cochrane of the University of Chicago has picked up on the idea as well in two recent blog posts (here and here). Others seem to be joining the upstart school as well. The new argument seems simple: given the Fisher equation, in which the nominal interest rate equals the real interest rate plus the (expected) rate of inflation, a central bank can meet its inflation target by setting a fixed nominal interest rate target consistent with its inflation target and keeping it there. Once the central bank sets its target, the long-run neutrality of money, implying that the real interest rate is independent of the nominal targets set by the central bank, ensures that inflation expectations must converge on rates consistent with the nominal interest rate target and the independently determined real interest rate (i.e., the real yield curve), so that the actual and expected rates of inflation adjust to ensure that the Fisher equation is satisfied. If the promise of the central bank to maintain a particular nominal rate over time is believed, the promise will induce a rate of inflation consistent with the nominal interest-rate target and the exogenous real rate. The heretical views expressed by Williamson and Cochrane and earlier by Kocherlakota have understandably elicited scorn and derision from conventional monetary theorists, whether Keynesian, New Keynesian, Monetarist or Market Monetarist. (Williamson having appropriated for himself the New Monetarist label, I regrettably could not preserve an appropriate symmetry in my list of labels for monetary theorists.) As a matter of fact, I wrote a post last December challenging Williamson’s reasoning in arguing that QE had caused a decline in inflation, though in his initial foray into uncharted territory, Williamson was actually making a narrower argument than the more general thesis that he has more recently expounded. Although deep down, I have no great sympathy for Williamson’s argument, the counterarguments I have seen leave me feeling a bit, shall we say, underwhelmed. That’s not to say that I am becoming a convert to New Monetarism, but I am feeling that we have reached a point at which certain underlying gaps in monetary theory can’t be concealed any longer. To explain what I mean by that remark, let me start by reviewing the historical context in which the ruling doctrine governing central-bank operations via adjustments in the central-bank lending rate evolved. The primary (though historically not the first) source of the doctrine is Henry Thornton in his classic volume The Nature and Effects of the Paper Credit of Great Britain. Even though Thornton focused on the policy of the Bank of England during the Napoleonic Wars, when Bank of England notes, not gold, were legal tender, his discussion was still in the context of a monetary system in which paper money was generally convertible into either gold or silver. Inconvertible banknotes – aka fiat money — were the exception not the rule. Gold and silver were what Nick Rowe would call alpha money. All other moneys were evaluated in terms of gold and silver, not in terms of a general price level (not yet a widely accepted concept). Even though Bank of England notes became an alternative alpha money during the restriction period of inconvertibility, that situation was generally viewed as temporary, the restoration of convertibility being expected after the war. The value of the paper pound was tracked by the sterling price of gold on the Hamburg exchange. Thus, Ricardo’s first published work was entitled The High Price of Bullion, in which he blamed the high sterling price of bullion at Hamburg on an overissue of banknotes by the Bank of England. But to get back to Thornton, who was far more concerned with the mechanics of monetary policy than Ricardo, his great contribution was to show that the Bank of England could control the amount of lending (and money creation) by adjusting the interest rate charged to borrowers. If banknotes were depreciating relative to gold, the Bank of England could increase the value of their notes by raising the rate of interest charged on loans. The point is that if you are a central banker and are trying to target the exchange rate of your currency with respect to an alpha currency, you can do so by adjusting the interest rate that you charge borrowers. Raising the interest rate will cause the exchange value of your currency to rise and reducing the interest rate will cause the exchange value to fall. And if you are operating under strict convertibility, so that you are committed to keep the exchange rate between your currency and an alpha currency at a specified par value, raising that interest rate will cause you to accumulate reserves payable in terms of the alpha currency, and reducing that interest rate will cause you to emit reserves payable in terms of the alpha currency. So the idea that an increase in the central-bank interest rate tends to increase the exchange value of its currency, or, under a fixed-exchange rate regime, an increase in the foreign exchange reserves of the bank, has a history at least two centuries old, though the doctrine has not exactly been free of misunderstanding or confusion in the course of those two centuries. One of those misunderstandings was about the effect of a change in the central-bank interest rate, under a fixed-exchange rate regime. In fact, as long as the central bank is maintaining a fixed exchange rate between its currency and an alpha currency, changes in the central-bank interest rate don’t affect (at least as a first approximation) either the domestic money supply or the domestic price level; all that changes in the central-bank interest rate can accomplish is to change the bank’s holdings of alpha-currency reserves. It seems to me that this long well-documented historical association between changes in the central-bank interest rates and the exchange value of currencies and the level of private spending is the basis for the widespread theoretical presumption that raising the central-bank interest rate target is deflationary and reducing it is inflationary. However, the old central-bank doctrine of the Bank Rate was conceived in a world in which gold and silver were the alpha moneys, and central banks – even central banks operating with inconvertible currencies – were beta banks, because the value of a central-bank currency was still reckoned, like the value of inconvertible Bank of England notes in the Napoleonic Wars, in terms of gold and silver. Why do I say that we don’t know what determines the value of fiat money in a Neo-Fisherite world? Well, consider this. Almost three weeks ago I wrote a post in which I suggested that Bitcoins could be a massive bubble. My explanation for why Bitcoins could be a bubble is that they provide no real (i.e., non-monetary) service, so that their value is totally contingent on, and derived from (or so it seems to me, though I admit that my understanding of Bitcoins is partial and imperfect), the expectation of a positive future resale value. However, it seems certain that the resale value of Bitcoins must eventually fall to zero, so that backward induction implies that Bitcoins, inasmuch as they provide no real service, cannot retain a positive value in the present. On this reasoning, any observed value of a Bitcoin seems inexplicable except as an irrational bubble phenomenon. Most of the comments I received about that post challenged the relevance of the backward-induction argument. The challenges were mainly of two types: a) the end state, when everyone will certainly stop accepting a Bitcoin in exchange, is very, very far into the future and its date is unknown, and b) the backward-induction argument applies equally to every fiat currency, so my own reasoning, according to my critics, implies that the value of every fiat currency is just as much a bubble phenomenon as the value of a Bitcoin. My response to the first objection is that even if the strict logic of the backward-induction argument is inconclusive, because of the long and uncertain duration of the time elapse between now and the end state, the argument nevertheless suggests that the value of a Bitcoin is potentially very unsteady and vulnerable to sudden collapse. Those are not generally thought to be desirable attributes in a medium of exchange. My response to the second objection is that fiat currencies are actually quite different from Bitcoins, because fiat currencies are accepted by governments in discharging the tax liabilities due to them. The discharge of a tax liability is a real (i.e. non-monetary) service, creating a distinct non-monetary demand for fiat currencies, thereby ensuring that fiat currencies retain value, even apart from being accepted as a medium of exchange. That, at any rate, is my view, which I first heard from Earl Thompson (see his unpublished paper, “A Reformulation of Macroeconomic Theory” pp. 23-25 for a derivation of the value of fiat money when tax liability is a fixed proportion of income). Some other pretty good economists have also held that view, like Abba Lerner, P. H. Wicksteed, and Adam Smith. Georg Friedrich Knapp also held that view, and, in his day, he was certainly well known, but I am unable to pass judgment on whether he was or wasn’t a good economist. But I do know that his views about money were famously misrepresented and caricatured by Ludwig von Mises. However, there are other good economists (Hal Varian for one), apparently unaware of, or untroubled by, the backward induction argument, who don’t think that acceptability in discharging tax liability is required to explain the value of fiat money. Nor do I think that Thompson’s tax-acceptability theory of the value of money can stand entirely on its own, because it implies a kind of saw-tooth time profile of the price level, so that a fiat currency, earning no liquidity premium, would actually be appreciating between peak tax collection dates, and depreciating immediately following those dates, a pattern not obviously consistent with observed price data, though I do recall that Thompson used to claim that there is a lot of evidence that prices fall just before peak tax-collection dates. I don’t think that anyone has ever tried to combine the tax-acceptability theory with the empirical premise that currency (or base money) does in fact provide significant liquidity services. That, it seems to me, would be a worthwhile endeavor for any eager young researcher to undertake. I don’t say that Williamson and his Neo-Fisherite colleagues are correct. Nor have they, to my knowledge, related their arguments to Fischer Black’s work. What I do say (indeed this is a problem I raised almost three years ago in one of my first posts on this blog) is that existing monetary theories of the price level are unable to rule out his result, because the behavior of the price level and inflation seems to depend, more than anything else, on expectations. And it is far from clear to me that there are any fundamentals in which these expectations can be grounded. If you impose the rational expectations assumption, which is almost certainly wrong empirically, maybe you can argue that the central bank provides a focal point for expectations to converge on. The problem, of course, is that in the real world, expectations are all over the place, there being no fundamentals to force the convergence of expectations to a stable equilibrium value. In other words, it’s just a mess, a bloody mess, and I do not like it, not one little bit. The stickiness of wages seems to be one of the key stylized facts of economics. For some reason, the idea that sticky wages may be the key to explaining business-cycle downturns in which output and employment– not just prices and nominal incomes — fall is now widely supposed to have been a, if not the, major theoretical contribution of Keynes in the General Theory. The association between sticky wages and Keynes is a rather startling, and altogether unfounded, inversion of what Keynes actually wrote in the General Theory, heaping scorn on what he called the “classical” doctrine that cyclical (or in Keynesian terminology “involuntary”) unemployment could be attributed to the failure of nominal wages to fall in response to a reduction in aggregate demand. Keynes never stopped insisting that the key defining characteristic of “involuntary” unemployment is that a nominal-wage reduction would not reduce “involuntary” unemployment. The very definition of involuntary unemployment is that it can only be eliminated by an increase in the price level, but not by a reduction in nominal wages. Keynes devoted three entire chapters (19-21) in the General Theory to making, and mathematically proving, that argument. Insofar as I understand it, his argument doesn’t seem to me to be entirely convincing, because, among other reasons, his reasoning seems to involve implicit comparative-statics exercises that start from a disequlibrium situation, but that is definitely a topic for another post. My point is simply that the sticky-wages explanation for unemployment was exactly the “classical” explanation that Keynes was railing against in the General Theory. So it’s really quite astonishing — and amusing — to observe that, in the current upside-down world of modern macroeconomics, what differentiates New Classical from New Keynesian macroeconomists is that macroecoomists of the New Classical variety, dismissing wage stickiness as non-existent or empirically unimportant, assume that cyclical fluctuations in employment result from high rates of intertemporal substitution by labor in response to fluctuations in labor productivity, while macroeconomists of the New Keynesian variety argue that it is nominal-wage stickiness that prevents the steep cuts in nominal wages required to maintain employment in the face of exogenous shocks in aggregate demand or supply. New Classical and New Keynesian indeed! David Laidler and Axel Leijonhufvud have both remarked on this role reversal. Many possible causes of nominal-wage stickiness (especially in the downward direction) have been advanced. For most of the twentieth century, wage stickiness was blamed on various forms of government intervention, e.g., pro-union legislation conferring monopoly privileges on unions, as well as other forms of wage-fixing like minimum-wage laws and even unemployment insurance. Whatever the merits of these criticisms, it is hard to credit claims that wage stickiness is mainly attributable to labor-market intervention on the side of labor unions. First, the phenomenon of wage stickiness was noted and remarked upon by economists as long ago as the early nineteenth century (e.g., Henry Thornton in his classic The Nature and Effects of the Paper Credit of Great Britain) long before the enactment of pro-union legislation. Second, the repeal or weakening of pro-union legislation since the 1980s does not seem to have been associated with any significant reduction in nominal-wage stickiness. Since the 1970s, a number of more sophisticated explanations of wage stickiness have been advanced, for example search theories coupled with incorrect price-level expectations, long-term labor contracts, implicit contracts, and efficiency wages. Search theories locate the cause of wage nominal stickiness in workers’ decisions about what wage offers to accept. Thus, the apparent downward stickiness of wages in a recession seems to imply that workers are turning down offers of employment or quitting their jobs in the mistaken expectation that search will uncover better offers, but that doesn’t seem to be what happens in recessions, when quits decline and layoffs increase. Long-term contracts can and frequently are renegotiated when conditions change. Implicit contracts also can be adjusted when conditions change. So insofar as these theories posit that workers are somehow making decisions that lead to their unemployment, the story seems to be incomplete. If workers could be made better off by accepting reduced wages instead of being unemployed, why isn’t it happening? Efficiency wages posit a different cause for wage stickiness: that employers have cleverly discovered that by overpaying workers, workers will work their backsides off to continue to be considered worthy of receiving the rents that their employers are conferring upon them. Thus, when a recession hits, employers use the opportunity to weed out their least deserving employees. This theory at least has the virtue of not assigning responsibility for sub-optimal decisions to the workers. All of these theories were powerfully challenged about eleven or twelve years ago by Truman Bewley in a book Why Wages Don’t Fall During a Recession. (See also Peter Howitt’s excellent review of Bewely’s book in the Journal of Economic Literature.) Bewley, though an accomplished theorist, simply went out and interviewed lots of business people, asking them to explain why they didn’t cut wages to their employees in recessions rather than lay off workers. Overwhelmingly, the responses Bewley received did not correspond to any of the standard theories of wage-stickiness. Instead, business people explained wage stickiness as necessary to avoid a collapse of morale among their employees. Layoffs also hurt morale, but the workers that are retained get over it, and those let go are no longer around to hurt the morale of those that stay. While I have always preferred the search explanation for apparent wage stickiness, which was largely developed at UCLA in the 1960s (see Armen Alchian’s classic “Information costs, Pricing, and Resource Unemployment”), I recognize that it doesn’t seem to account for the basic facts of the cyclical pattern of layoffs and quits. So I think that it is clear that wage stickiness remains a problematic phenomenon. I don’t claim to have a good explanation to offer, but it does seem to me that an important element of an explanation may have been left out so far — at least I can’t recall having seen it mentioned. Let’s think about it in the following way. Consider the incentive to cut price of a firm that can’t sell as much as it wants at the current price. The firm is off its supply curve. The firm is a price taker in the sense that, if it charges a higher price than its competitors, it won’t sell anything, losing all its sales to competitors. Would the firm have any incentive to cut its price? Presumably, yes. But let’s think about that incentive. Suppose the firm has a maximum output capacity of one unit, and can produce either zero or one units in any time period. Suppose that demand has gone down, so that the firm is not sure if it will be able to sell the unit of output that it produces (assume also that the firm only produces if it has an order in hand). Would such a firm have an incentive to cut price? Only if it felt that, by doing so, it would increase the probability of getting an order sufficiently to compensate for the reduced profit margin at the lower price. Of course, the firm does not want to set a price higher than its competitors, so it will set a price no higher than the price that it expects its competitors to set. Now consider a different sort of firm, a firm that can easily expand its output. Faced with the prospect of losing its current sales, this type of firm, unlike the first type, could offer to sell an increased amount at a reduced price. How could it sell an increased amount when demand is falling? By undercutting its competitors. A firm willing to cut its price could, by taking share away from its competitors, actually expand its output despite overall falling demand. That is the essence of competitive rivalry. Obviously, not every firm could succeed in such a strategy, but some firms, presumably those with a cost advantage, or a willingness to accept a reduced profit margin, could expand, thereby forcing marginal firms out of the market. Workers seem to me to have the characteristics of type-one firms, while most actual businesses seem to resemble type-two firms. So what I am suggesting is that the inability of workers to take over the jobs of co-workers (the analog of output expansion by a firm) when faced with the prospect of a layoff means that a powerful incentive operating in non-labor markets for price cutting in response to reduced demand is not present in labor markets. A firm faced with the prospect of being terminated by a customer whose demand for the firm’s product has fallen may offer significant concessions to retain the customer’s business, especially if it can, in the process, gain an increased share of the customer’s business. A worker facing the prospect of a layoff cannot offer his employer a similar deal. And requiring a workforce of many workers, the employer cannot generally avoid the morale-damaging effects of a wage cut on his workforce by replacing current workers with another set of workers at a lower wage than the old workers were getting. So the point that I am suggesting seems to dovetail with morale-preserving explanation for wage-stickiness offered by Bewley. If I am correct, then the incentive for price cutting is greater in markets for most goods and services than in markets for labor employment. This was Henry Thornton’s observation over two centuries ago when he wrote that it was a well-known fact that wages are more resistant than other prices to downward pressure in periods of weak demand. And if that is true, then it suggests that real wages tend to fluctuate countercyclically, which seems to be a stylized fact of business cycles, though whether that is indeed a fact remains controversial. In my previous installment in this series, I began discussing Hawtrey’s analysis of a banking system that creates credit money convertible into a pure fiat money. I noted what seem to me to be defects in Hawtrey’s analysis, mainly related to his incomplete recognition of all the incentives governing banks when deciding how much money to create by making loans. Nevertheless, it is worth following Hawtrey, even with the gap, as he works his way through his analysis . But, before we try to follow Hawtrey, it will be helpful to think about where he is heading. In his analysis of a pure fiat money system, all — actually not quite all, but almost all — of the analytical work was done by considering how a difference between the amount of fiat money people want to hold and the greater or lesser amount that they actually do hold is resolved. If they hold less money than they want, total spending decreases as people try (unsuccessfully in the aggregate) to build up their cash balances, and if they hold more money than they want, spending increases as people try (unsuccessfully in the aggregate) to part with their excess cash hoaldings. Reaching a new equilibrium entails an adjustment of the ratio of total spending to the stock of fiat money that characterized the initial equilibrium. There may be an interest rate in such an economy, but a change in the interest rate plays no part in the adjustment process that restores equilibrium after a monetary shock (i.e., a change in the stock of fiat money). Hawtrey aims to compare (and contrast) this adjustment process with the adjustment process to a change in the quantity of fiat money when not all money is fiat money — when there is also credit money (created by banks and convertible into fiat money) circulating along with fiat money. In analyzing a monetary disturbance to a credit-money system, Hawtrey takes as his starting point a banking system in equilibrium, with banks and individuals holding just the amount of currency, reserves and deposits that they want to hold. He then posits a reduction in the total stock of currency. Hawtrey goes on to explain this point with a numerical example. Suppose total purchasing power (i.e., the sum of currency plus deposits) were £1 billion of which £250 million were currency and £750 million deposits. If the stock of currency were reduced by 10%, the amount of currency would fall to £225 million, with total stock of purchasing power falling to £975 million. (Note by the way, that Hawtrey’s figure for total purchasing power, or the total stock of money, does not correspond to the usual definition of the money stock in which only currency held by the public, not by the banking system, are counted.) At any rate, the key point for Hawtrey is that under a fiat currency with a banking system, the percentage decrease (10%) in the stock of currency is not equal to the percentage decrease in the total stock of money (2.5%), so that a 10% reduction in the stock of currency, unlike the pure fiat currency case, would not force down the price level by 10% (at least, not without introducing other variables into the picture). Having replenished their holdings of currency by converting deposits into currency, the total cash holdings of the public are only slightly (2.5%) less than the amount they would like to hold, so that only a 2.5% reduction in total spending would seem to be necessary to restore the kind of monetary equilibrium on which Hawtrey was focused in discussing the pure fiat money case. A different sort of disequilibrium involving a different adjustment process had to be added to his analytical landscape. The new disequilibrium introduced by Hawtrey was that between the amount of currency held by the banks as reserves against their liabilities (deposits) and the amount of currency that they are actually holding. Thus, even though banks met the demands of their depositors to replenish the fiat currency that, by assumption, had been taken from their existing cash balances, that response by the banks, while (largely) eliminating one disequilibrium, also created another one: the banks now find that their reserves, given the amount of liabilities (deposits) on their balance sheets, are less than they would like them to be. Hawtrey is thus positing the existence of a demand function by the banks to hold reserves, a function that depends on the amount of liabilities that they create. (Like most banking theorists, Hawtrey assumes that the functional relationship between bank deposits and banks’ desired reserves is proportional, but there are obviously economies of scale in holding reserves, so that the relationship between bank deposits and desired reserves is certainly less than proportional.) The means by which banks can replenish their reserves, according to Hawtrey, again following traditional banking theory, is to raise the interest rate that they charge borrowers. Here, again, Hawtrey was not quite on the mark, overlooking the possibility that banks could offer to pay interest (or to increase the rate that they were already paying on deposits) as a way of reducing the tendency of depositors to withdraw deposits in exchange for currency. The special insight brought by Hawtrey to this analysis is that a particular group of entrepreneurs (traders and merchants), whose largest expense is the interest paid on advances from banks to finance their holdings of inventories, are highly sensitive to variations in the bank lending rate, and adjust the size of their inventories accordingly. And since it is the manufacturers to whom traders and merchants are placing orders, the output of factories is necessarily sensitive to the size of the inventories that merchants and traders are trying to hold. Thus, if banks, desiring to replenish their depleted reserves held against deposits, raise interest rates on loans, it will immediately reduce the size of inventories that merchants and traders want to hold, causing them to diminish their orders to manufacturers. But as manufacturers reduce output in response to diminished orders from merchants, the incomes of employees and others providing services and materials to the manufacturers will also fall, so that traders and merchants will find that they are accumulating inventories because their sales to dealers and retailers are slackening, offsetting the effect of their diminished orders to manufacturers, and, in turn, causing merchants and traders to reduce further their orders from manufacturers. As this process works itself out, prices and output will tend to fall (at least relative to trend), so that traders and merchants will gradually succeed in reducing their indebtedness to the banks, implying that the total deposits created by the banking system will decrease. As their deposit liabilities decline, the amount of reserves that the banks would like to hold declines as well, so that gradually this adjustment process will restore an equilibrium between the total quantity of reserves demanded by the banking system and the total quantity of reserves that is made available to the banks (i.e., the total quantity of currency minus the amount of currency that the public chooses to hold as cash). However, the story does not end with the restoration of equilibrium for the banking system. Despite equilibrium in the banking system, total spending, output, and employment will have fallen from their original equilibrium levels. Full equilibrium will not be restored until prices and wages fall enough to make total spending consistent with a stock of currency 10% less than it was in the original equilibrium. Thus, in the end, it turns out that a 10% reduction in the quantity of currency in a monetary system with both fiat money and credit money will cause a 10% reduction in the price level when a new equilibrium is reached. However, the adjustment process by which a new equilibrium is reached, involving changes not only in absolute prices and wages, but in interest rates, is more complicated than the adjustment process in a pure fiat money system. Hawtrey summed up his analysis in terms of three interest rates. First, the natural rate “which represented the actual labour-saving value of capital at the level of capitalisation reached by industry. This ratio of labour saved per annum to labour expended on first cost is a physical property of the capital actually in use, and under perfectly stable monetary conditions is equal to the market rate of interest.” Second the market rate which “diverges from the natural rate according to the tendency of prices. When prices are rising them market rate is higher, and when falling lower, than the natural rate, and this divergence is due to the fat that the actual profits of business show under those conditions corresponding movements.” Third, there is the profit rate, “which represents the true profits of business prevailing for the time being,” and does not necessarily coincide with the market rate. The market rate is in fact the bankers’ rate, and is greater or less than the profit rate, according as the bankers wish to discourage or encourage borrowing. . . .
Consequently, for the banker’s purposes, a “high” rate of interest is one which is above the profit rate, and it is only when the rate of interest is equal to the profit rate that there is no tendency towards either an increase or decrease in temporary borrowing. In any of the three cases the rate of interest may be either above or below the natural rate. If the natural rate is 4% and the profit rate in consequence is only 2%, a market rate of 3% is “high,” and will result in a curtailment of borrowing. If prices are rising and the profit rate is 6%, a market rate of 5% is “low,” and will be compatible with an increased borrowing. In the case we are now considering we assumed the disturbance to be a departure from perfectly stable conditions, in which the market rate of interest would be identical with the “natural” rate. On the contraction of the currency occurring the bankers raised the market rate above the natural rate. But at the same time the fall of prices began, and there must consequently be a fall of the profit rate below the natural rate. As we now see, the market rate may actually fall below the natural rate, and so long as it remains above the profit rate it will still be a “high” rate of interest. Although it seems to me that Hawtrey, in focusing exclusively on the short-term lending rate of banks to explain the adjustment of the banking system to a disturbance, missed an important aspect of the overall picture (i.e., the deposit rate), Hawtrey did explain the efficacy of a traditional tool of monetary policy, the short-term lending rate of the banking system (the idea of a central bank having not yet been introduced at this stage of Hawtrey’s exposition). And he did so while avoiding the logical gap in the standard version of the natural-rate-market-rate theory as developed by both Thornton and Wicksell (see section 3 of my paper on Ricardo and Thornton here) explaining why changes in the bank rate could affect aggregate demand without assuming, as do conventional descriptions of the adjustment process, that the system was adjusting to an excess demand for or an excess supply of bank deposits.